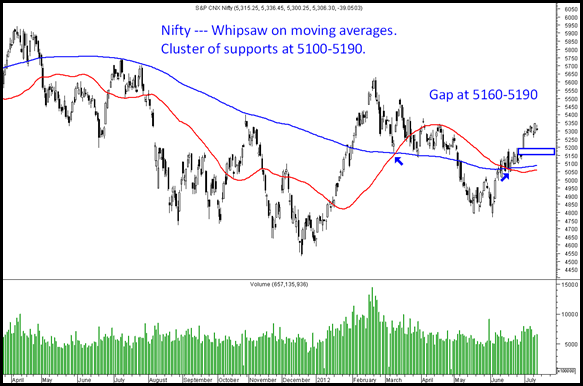 Nifty – A breather towards 5100-5190. -> The expected ping pong between 5270-5370 got over with Infy results today and a small breakdown below recent supports of 5250-5270 is seen. - > We may now be heading to the gap of 5160-5190 and 5100-5120 remains a strong area with previous breakout and moving averages in that band. - > Earlier we saw a nice golden cross at 5300 and now at 5130-5150 we see a death cross. Such a signal coming so fast indicates markets will spend some time in this range. - > The new range on a broader basis would be 5100-5400.The trend would change to down if it goes below 5000 levels which was the recent important bottoms. - > The strategy now should be to buy in dips to 5100/5180 with a stop of 5000. The next upside will take time but should cross 5400 ideally and even head to 5650. The medium term view remains positive but a short term correction is what we are looking for. Start focusing on midcaps again. 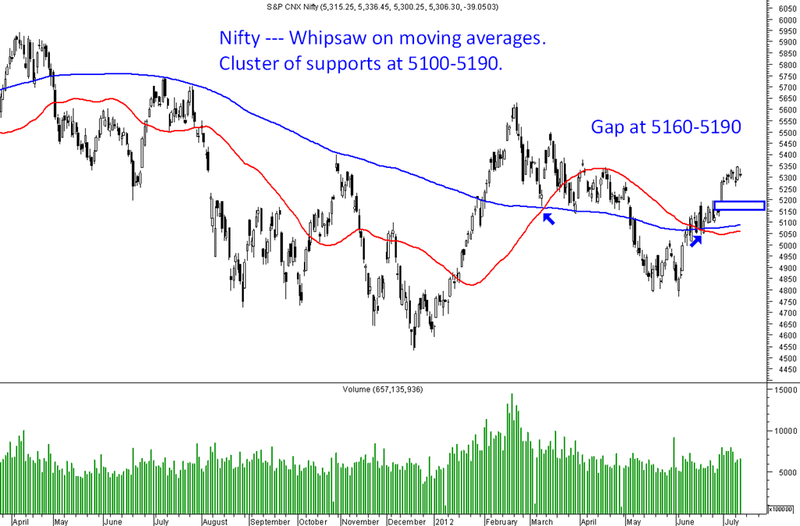 Sugar sector and micap bank look interesting on sharp dips or in momentum. Since you have suggested to sugar stocks, what are your views on Sakthi Sugars ? This stock has risen 30 % since last few weeks and if you check its last quarter EPS, it is around Rs7 and if the results are good in next 3 quarters + sector sentiments good, you can see this stock rising. Another stock is IOB. Please share your thoughts on these..
All the sugar companies are placed at a very low valuation to replacement cost. Pick your choice if cycle changes all will run. Thanks for your comment. Always appreciate reading your blog. YOUR ANALYSIS IS WONDERFULL AND VERY USEFULL TO EVERY PERSON .THANKS A LOT FOR PROVIDING SUCH INFORMATION. No view on roto pumps. Asahi can be a good long term bet. I think the result pop is done now we may buy around 43 if it comes.